Design world is so huge that it envelopes all artists and designers into this horizon, they work round the clock to produce something out of the blue, however you will always see new techniques and types being explored by the artists who not only revise the methods of designing but they introduce new ways to go about the designs, they put things out of the carpet and make them familiar. This is why every now and then you will see writers writing about articles related to design happenings. Bloggers are much alarmed about all important ingredients to have a good design blog, they add all the surprising and intentional elements to make the website look interesting, striking and worth seeing. They add up good fonts, textures and all those artistic appalling features that reflect the true spirit and stance of a design blog. Designers are never spare, even when they are doing their projects, they have tons of works lined up into their minds to deliver. They hardly find time to stand up from their work desk and to go out & enjoy. This is the dilemma of working class, who struggles harder to make the desire end appeasing. Today my post is made for all those designers who have been seeking mockups for their projects. Thank you all for appreciating the efforts we are putting in this blog, we are working nonstop to produce quality content, informative articles, good design projects, artists and all design feed which not only educates you but also inspires you to make something on your own like that. 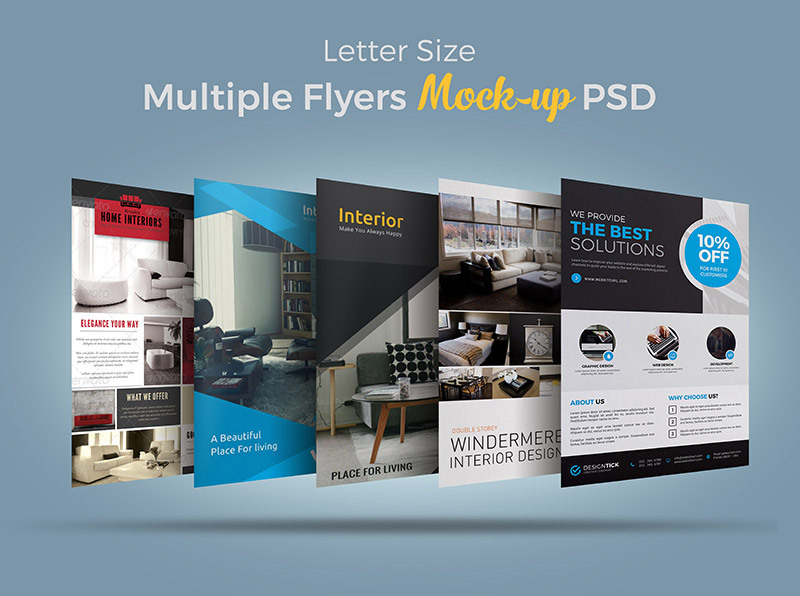 Down here is the post of letter size multiple flyers mockup PSD, if you have to display multiple products/choices, then this bundle of flyers is the best option for you, you can insert in your elements and it is ready to serve the purpose. These are totally apt, well-built and appealing nevertheless. I hope you all stay connected to us and will encourage us to put forward the best that we can for you all. Here we go with a bang! 2. Layers are hidden to decrease the size of file kindly unhide and place your design on red & blue colored layers. 4. And don’t forget to follow or subscribe for more high quality freebies & awesome articles.